M.G. Wheaton's debut novel has been getting some great reviews, including a four-star one in the pages of SFX! This action-packed cyber-thriller centres on Emily, an artificial consciousness designed to help humans process trauma. When the sun starts to die, five billion years earlier than expected, Emily finds a potential answer buried deep in the human genome. But then her lab is attacked, and she's forced to go on the run from a huge conspiracy. Cue a race against time to save humanity! 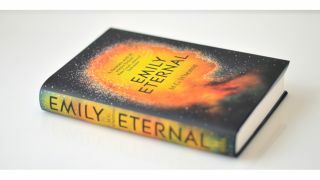 Emily Eternal is available to buy as a hardback, ebook or audiobook from April 23. Thanks to Hodder & Stoughton we have 10 copies to give away. To put your name in the hat for the chance to win one, simply answer the question below!